Moving to Strategy & Discussion and pinning. Awesome Post!! I've done some math and still confuse: Should I use Lead The Charge or Press The Attack on Kara? My Kara team contains 1 Infiltrator, 2 Preserver and 1 Heavy Operator. So if I use Lead the charge, my Kara will gain -20% damage from all; but use Press the attack, all team member will gain +15% damage to all. anyone have a chart or graph for the M4X grenade launcher ? m4gx is just add 6300 damage every 3s. it doesn't really need a chart. it is the same with any sf. 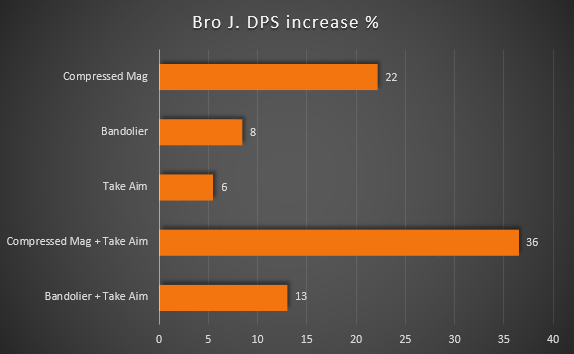 Two request ---- Can we get a stat chart on best setup for least damage taken. Whats the point of having high DPS if unit dies in one shot. 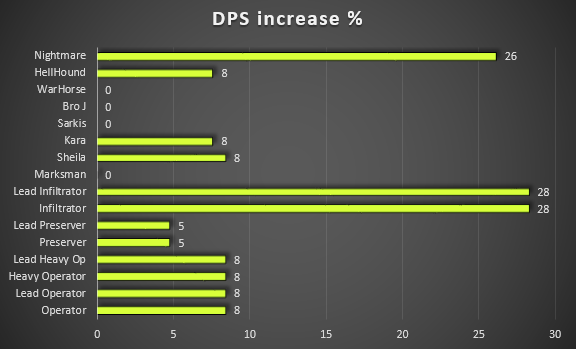 I like to be able to use the sliding scale of DPS output to DMG taken. Also, can we take in account the new Shrapnel Ordnance? some units like infiltrators and hellhounds only have 3 slots . your chart shows 4 ops. so what 3 are best for those units? Marksmen and leads, Turning into commandos .... Does that change the set ups in my components...been working on this for a few months, Any one know in any changes in there set ups. Never mind I see you took dpr into account. Brilliant... This is makes so much sense. Excellent work MX36. I have to ask, what software are you using to build these graphs? My questions i son the Marksmen(Now Commando). 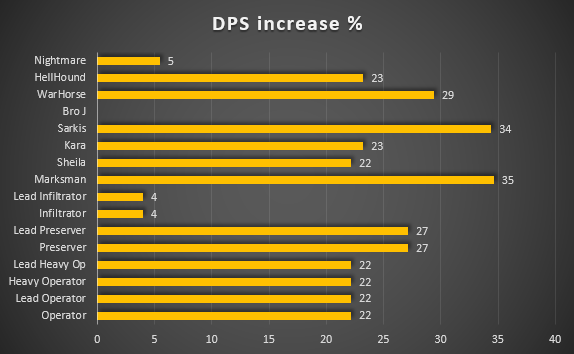 You show that it has a negative effect on DPS with "Take Aim" equipped only. 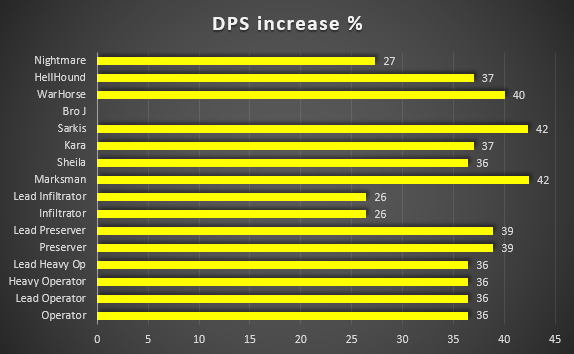 -And would not [Compressed Mag, Heavy Ord, Ap Rockets/12%dps boost] be better choce? also keep in mind Comp Mag affects M4GX also. the M4GX has its own firing cycle as a secondary weapon. would it be possible to test if compressed mag affects M4GX fire rate? 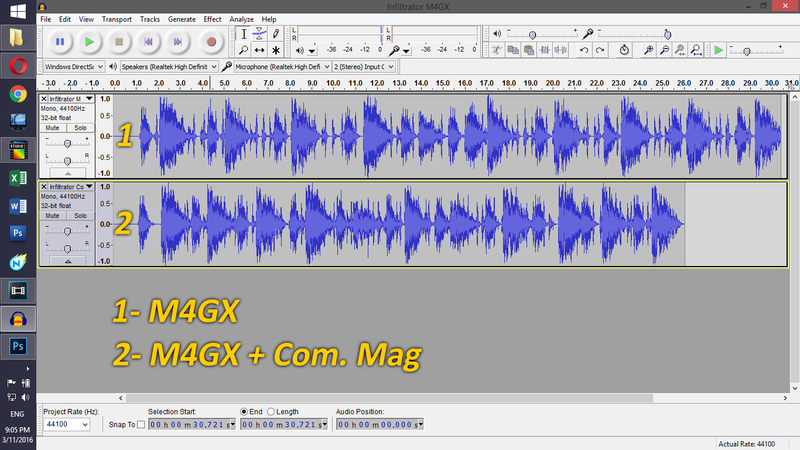 It's hard to visually determine how much changed in the reload speed and it's also not easy to find through a sound graph since there are too many things happening at the same time. 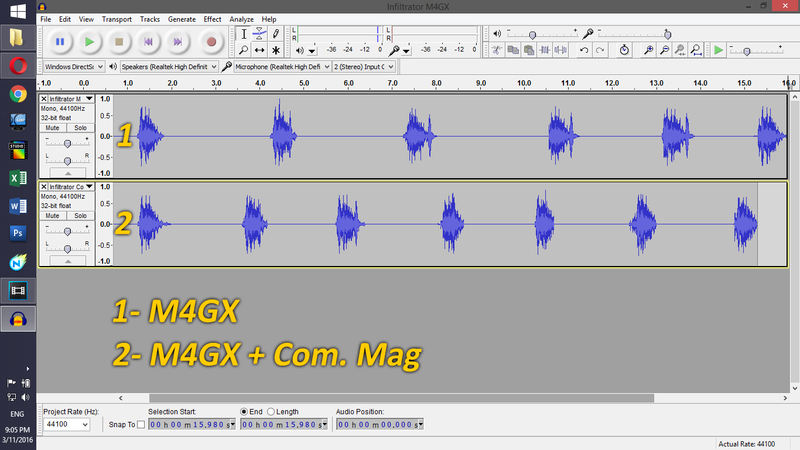 Here's an isolated sound wave graph of only M4GX firing. you can clearly see the second one with the Com. Mag equipped has more grenades fired compared to the one without! I have both on video if anyone needs more evidence, but we can safely say The Compressed Magazine DOES affect the secondary weapons Reload Speed. thanks @meemadd for pointing that out! While I agree with you on the Com. Mag. influence on the M4GX, I don't think the Bandolier would affect the fire rate! because the M4GX has only one grenade fired at a time. it would though increase the speed of the grenade reaching its target. When did it become necessary to have math degree to play a war game? No wonder I get my **** kicked. @MX36 I did some math on the Ultra Tank trying to see if the new Coolant Chambers are any good. 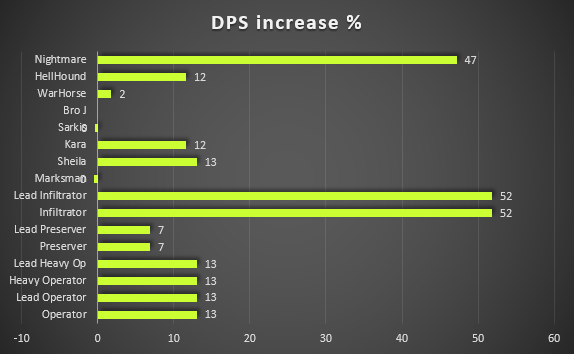 With ROF increase of 40% I'm only geting a 12.9% gain on DPS. Can you please verify if that's correct? It seems very little increment. I used your calculations and made an Excel Spreadsheet. The way you explained it just makes sense and the numbers seem to come out correctly. Nice job. Below is a dropbox link to the Excel spreadsheet for anyone who wants it. Most of the common damage modifier mods are included. Let me know if find are any errors. 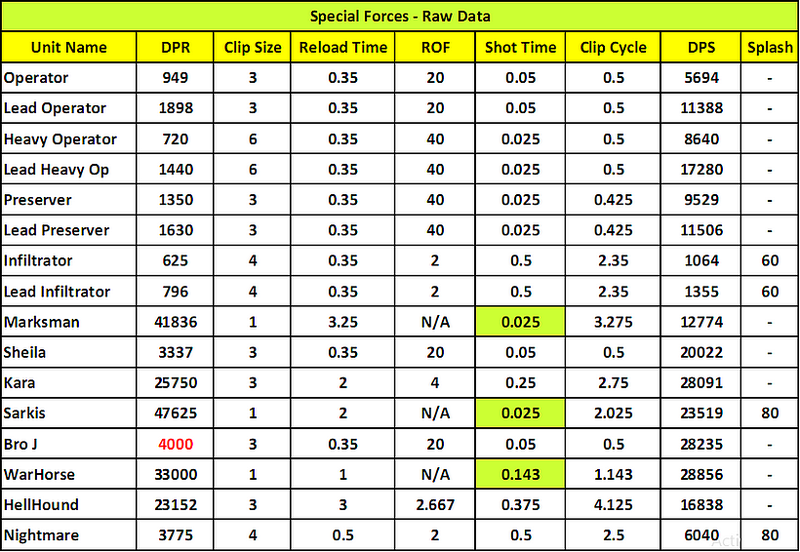 There's a slight error regarding Jeremiah's damage and a major error in the formula on how reload speed affects dps. I know this post was ages ago but just gonna put this out here for those who still use his excel spreadsheet. GUYS WHICH IS BETTER...HIGH CALIBER STACKED WITH (R) MG4X OR HIGH CALIBER STACKED WITH HEAVY ORDINANCE...AND WHY? 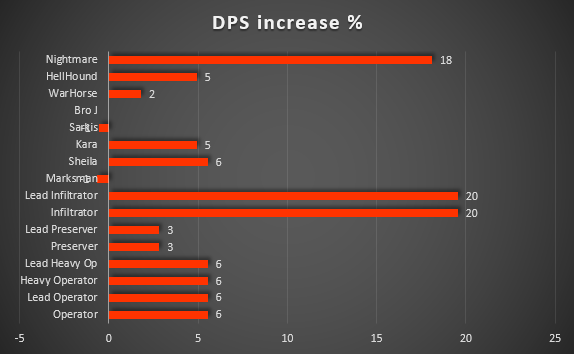 It depends on the unit and its base DPS. Heavy Ordinance gives you a 30% boost, (R) MG4X gives you 4,200 extra DPS, If the unit has >14,000 DPS then Heavy Ordinance is better, <14,000 base DPS then (R) MG4X is better. That's my opinion, you also need to consider (R) MG4X has/adds splash damage to units. will the grenadiers be added to the list? **** that's an awesome data collection. Guess the days of just simple math and unit specs is over, lol.